He said he believed the people of this country had “subliminally” long stored decisions about an ideal future. Now its six years later and we now have a clearer picture of what Chamisa believes to be the ideal future — impressive and paradise like. He wrote the piece nine months before the 2013 election, and it was clear at the time that he, as the MDC-T organising secretary, could visualise the defeat of his own party. It had been four years of “subliminally” stalling decisions in government, not about these fictitious super intelligent achievements that Chamisa now brags about at rallies in a tellingly revisionist manner. MDC-T was hardly conscious of its own presence in Government during the inclusive Government, and that is why Tendai Biti was fighting the war veterans, opposing indigenisation, and as Chamisa wrote “subliminally” stalling Government decisions at the time. MDC-T still thought they were an opposition party all through the time. We were in the process of writing the Constitution at the time Chamisa wrote this piece. He, Morgan Tsvangirai and Abednico Bhebhe said MDC-T was in the constitution-making process only for political expediency, and that they were totally uncommitted to the process since the party envisaged a day in the future when it would be in power and able to write its own constitution. His boss Morgan Tsvangirai was more brazen about it. We have not heard Chamisa say anything about abandoning the Constitution now, most likely because he has totally forgotten that this was once a campaign strategy whose only rationale was to be seen to be protesting something that Zanu-PF was doing. Now he is protesting the Zanu-PF investment drive, protesting the party’s re-engagement policy, protesting the age of politicians in Zanu-PF, and indeed protesting the very existence of the revolutionary liberation party itself. The presence of MDC-T in the inclusive Government was not messianic as Chamisa brags at his rallies today. Rather, it guaranteed that no patriotic Zimbabwean would vote for the reckless indiscipline and corruption that had become synonymous with the MDC-T leadership at the time. 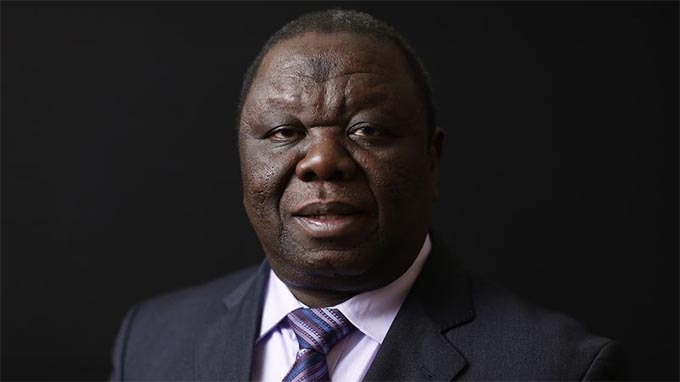 Tsvangirai’s own character was hopeless, stricken by humiliating scandals. Now there is hope after the ouster of long time leader Robert Mugabe, there is a massive investment drive, and there is no violence to protest about, except the one being perpetrated on Chamisa’s opponents by his thuggish Youth Vanguard. The only protest Chamisa has is the age of ED Mnangagwa. Like himself taking over the leadership of MDC-T after 19 years of Tsvangirai’s leadership, Mnangagwa has taken over the leadership of Zanu-PF after 40 years of Mugabe’s leadership. Chamisa cannot translate Mugabe’s leadership shortcomings to Mnangagwa without implying that the shortcomings of Tsvangirai are also transferrable to his own status as a politician. Both men were short-term deputies to the departed two politicians. The economic crisis of Zimbabwe between 2000 and 2009 was a direct result of the isolation of the country by the major Western economies through illegal sanctions imposed on the country at the instigation of Chamisa’s party. We want to recover from that, yet Chamisa, Biti and one Dewa Mavhinga were recently in the United States begging for more and more sanctions until such a time the sanctions result in an MDC-Alliance led government. At this time, I expect nothing short of Chamisa calling on America and Australia to lift all forms of sanctions against our country. The fight against the isolation of our country is a national cause, and must be embraced by all in our political leadership. The irony of the MDC-T protesting and fighting national causes like land reforms, indigenisation and diplomatic re-engagement is telling of how our politicians lack the maturity needed for nation building. He said he preferred a job plan, starting off with investment. President Mnangagwa comes embracing indigenisation, a job plan and investment; and Chamisa dismisses him as too old to do that. Yet he was young enough to do what Chamisa and Tsvangirai failed to do in all their youthfulness — replace or remove Mugabe. Now Chamisa rides on the demise of Mugabe, courtesy of Zanu-PF and ED Mnangagwa; just to tell the nation that by mere youthfulness at the age of 40, he has the presidential messianic super powers to build village airports for each home, replace dualisation of roads with instant eight lane freeways across the country, build new and complete cities, etc. The list is endless, and his supporters call the whole charade visionary. At a traffic ratio of 120 cars per 1 000 people, what Zimbabwe needs is more disposable income to afford more cars before we start dreaming of super-infrastructure for super high traffic densities. Our policies must be focused on production and employment creation, of course with proper and adequate infrastructure to support such envisaged industrialisation. MDC-T was never formed because its founders had an idea of what to do in terms of policy formulation or solutions to challenges facing Zimbabwe. Rather, the party was formed as a reactionary movement whose sole occupation was protesting the rule of Zanu-PF. Chamisa explained it all in his little and exciting essay. It was not the alternative plan to our Constitution, to our industry policy, or alternative economic policies that gave birth to MDC-T.
Anger and fury against the status quo did. He wrote this at a time his MDC-T adamantly prided itself in having disregarded the national report on the views of the people about what would constitute the Zimbabwean Constitution. This was an abrogation inspired not only by selfish partisan interests, but also by the influence from foreigners who were sponsoring the MDC-T at the time. It did not look pro-poor to protest against the land reform programme. It has never looked pro-poor to mobilise sanctions against one’s own country. MDC-T is indeed a labour-founded party, but white interests sadly hijacked the party when Tsvangirai was openly bought out by white capital from ex-white commercial farmers and Western moneybags way back in 2000. A social democratic and human-centred party that openly calls for the sanctioning of its own country in order to strangulate the populace to a point of rebellion against the incumbent Government is an insult to the philosophy of social democracy, and it is a mockery to humanity. Well, the party only managed a paltry 49 seats out of 210. Now, he in like manner vows that come September 2018 he will be luxuriously switching between the Harare State House and the Bulawayo one. My advice is bubble not so fast man, or if you bubble, remember to say farewell to the crowds. Elections are not won by slogans and rally declarations. There is a very good reason why Zanu-PF is not interested in the traditional rally style of campaigning. Soon everyone will come to understand. Chamisa is audacious to claim credit for every iota of success from the inclusive government. In 2012, he even said tobacco farmers needed to thank the MDC-T for the good business they were enjoying, not the land reform programme that gave the land in the first place. MDC-T never wanted the new tobacco farmers anywhere near the farms in the first place. Biti fought with all the energy and trademark froth he could muster to thwart and stop the restoration of the welfare fund for war veterans when he was Finance Minister, yet in his article Chamisa claimed glory for the restoration of the fund. Even at his rallies he does the same thing. Equally ironic is Chamisa’s opportunistic hailing of war veterans at his rallies these days. This is in contrast to his own utterances way back in 2000, when he was 22. The MDC-T stands tainted with its presence in the inclusive government from 2009 to 2013. Emmanuel Chiroto, the Harare deputy mayor who built himself a 24-bedroom house as soon as he made it into the local council, stands out as a prototype example of MDC-T councillors across the country — a corrupt lot that loots with reckless abandon. People have not suddenly forgotten just because Tsvangirai died and Chamisa took over. Here is a party whose officials in councils brazenly compete in the game of self-aggrandisement, corruptly parcelling pieces of land to each other to the point of not sparing even football fields and public parks. Apart from coming up with fancy names for its policy documents, the MDC-T has never really impressed in articulating what it stands for, much as the party postures very impressively on what it stands against. The mediocrity in MDC-T leadership is encyclopaedic; to borrow Chamisa’s complex vocabulary. The party leadership stands tainted as keener on corruption than its rivals in Zanu-PF. If there is one thing that the inclusive government did, it was exposing the MDC-T as a party of hopelessness, even in the context of a habitually blundering Zanu-PF under the last years of Mugabe. We have at the very most about three months before the country goes for elections, and the MDC Alliance is indeed sauntering towards a well-earned demise. All young successful politicians who have made it in election history won elections in spite of, not because of their age. It is only Chamisa who seems to think he is still a young man at the age of 40, and also to think that he is going to win a national election purely and entirely because of his age. This naivety comes with a huge political cost. Zanu-PF, in all its numerous shortcomings, is capable of defining what it stands for, and its policies often attract international attention, controversially or otherwise. President Mnangagwa is attracting international attention with his new economic policies. The crowd-hunting obsession that seems to have taken the better side of Chamisa is very misleading. Rally appearances do not exactly translate to voting patterns. In fact, the numbers of people who will ever gather at these rallies will not collectively exceed even half a million people at the very best, yet there are over five million voters out there watching the rallies happening and waiting to make a judgement and cast their vote. Right now they are watching a governing President Mnangagwa reviving the economy on the one hand; and an excited political debutant comically entertaining crowds at village rallies on the other. Seriously what was this nonsense about trying to contrive glory by claiming endorsement from the Nkomo family, even brazenly lying about it all? Chisa NHEMA Chisa! That is how the slogan must go. Zimbabwe we are one and together we will overcome.